Ten of Cups Tarot Card Meaning - All Explained HERE! The Ten of Cups is the tenth card in the Cups suit and is an extremely positive card. 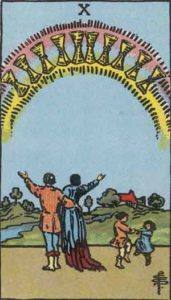 The illustration shows ten cups suspended in a rainbow with a couple, likely married, looking at it. Children play in the foreground and an idyllic village lays in the background. The Ten of Cups is all about happiness and being positive. The Ten of Cups represents fortune and happiness, and all good things we wish for. Past – The Ten of Cups in the Past position can mean a few things. A positive upbringing in a stable family, or a good place to grow up that has set you up for the world. Peace, or a relative lack of conflict have been prevalent in your life so far. It can also refer to the past few years, which would have been relatively free of negativity. Present – The Ten of Cups in the present position means things are going well. In a way, you might have escaped the thought patterns of needing to get better and improve at something. You’ve achieved what you set out to achieve. Look to a new adventure, or stay where you are for a while longer, there is nothing wrong with enjoying what you have accomplished, after all, that is what we set out to do when we begin anything. Future – The Ten of Cups in the future position reminds you of that idyllic image of your ideal life. You have to work hard to get there, but when you do, you’ll think nothing of the struggle. Things like mastery in your field, and people looking up to you for whichever reason will be common. We all have people we look up to, because they have achieved what they set out to do. If you continue working as hard as you are now, you’ll get there too. Work / Education – The Ten of Cups in regards to work or education means, as above, that people will start to look to you for input. It could be helping a classmate or colleague, or being put in charge of a project and having to dish out tasks. It’s a good thing. You’ve moving up, possibly even in the workplace hierarchy. Don’t treat it as a plateau for too long, there are always ways to improve. If you’re in college or studying elsewhere, see this as a good result to your course, it’ll likely open doors for you in future. Romance – The Ten of Cups in romance is a good sign if you’re in a committed relationship. Expect marriage, or at the very least a growing commitment. If things are going well, then they should continue to. Relax and enjoy the moments, that is what this card is all about. If you’re single, see your next relationship as a potential serious long term one. Friends – The Ten of Cups in regards to friendship suggests you have a good circle of friends, possibly a best friend who is almost like family to you. If this isn’t the case, someone may move into this position soon. Are you thinking of moving in with some friends? It might be a good idea! Try to work it out if it’s possible. Money – The Ten of Cups in regards to finances shows that money isn’t an object for you right now. Whatever state your accounts are in, they’re likely to stay the same or improve slightly. It’s good, don’t worry about it for a while. If it’s getting to you, it’s time to eliminate necessary outgoings. Health – The Ten of Cups in health means things are going to stay level. Expect no staggering improvements if you’re ill, but likewise if you’re healthy, don’t expect much change. If you’re training, you might find that you can’t push yourself enough just yet. Just keep up with what you’re doing, it’s likely that the state you’re in right now will be the same for the near future too. Spirituality and Mentality – The Ten of Cups in spirituality shows the future you want. Your ideal future should always be in your mind. You need to understand how other people got where they did and how you can get where you want to do. Help others with their goals. You’ve got a lot of experience that you can share. In Reverse, the Ten of Cups can represent a future that isn’t quite there yet. Something is stopping you from getting to this peaceful, loving place. it’s time to analyse your life, which parts aren’t you happy about and how can you change them? Who or what is stopping you from achieving your goals? If things feel very negative now, take solace in the fact that a loving, perfect future is available to you if you can find the right path to it. Look to others for help, and make sure you own mental health is in check; negative thought patterns can ruin an entire day. You need to identify and solve your issues to grow. Ten is a special number in numerology. Like nine, it can mean completion, but it can also represent the number one, but on a higher level. Tens should be treated both as the end of a cycle and the start of the next. The Ten of Cups in terms of numerology represents the goal that you have achieved. It may have been a great effort, possibly one of the hardest and most meaningful things you’ve had to do in your life. The hard work is over now, and you are free to reap the rewards. Many tens strongly suggest that you will be turning to a new chapter in your life. We’ve selected live tarot readers to give you a FREE 3 Minute interpretation of The Ten of Cups! Scroll through them below and pick your favorite one.